Mobile receipt printer with a convenient design - The mobile receipt printer Metapace M-20i offers you a powerful model which is ideally suited for a wide range of application areas. With a weight of only 228 grams, a print quality of 8 dots/mm (203 dpi) and a rapid print speed of up to 100 mm per second, the compact receipt printer proves itself in retail, as well as in hospitality, transportation and logistics. As needed, it prints labels and receipts, further expanding its area of application. • Mobile printer for retail, logistics, hospitality, transport, etc. Another plus of the M-20i is its simple integration into existing infrastructures: you connect the printer via Bluetooth or USB (batch), or directly (peer-to-peer) with the network. Thanks to iOS support, it also works in connection with iPhones, iPads and iPods. An integrated NFC tag lets the user easily and automatically pair with a mobile terminal, with the help of the Easy Bluetooth Pairing function. 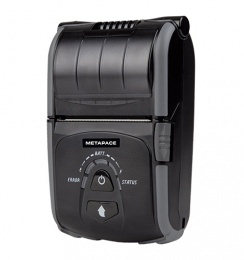 The M-20i comes with a comprehensive range of accessories: a belt clip (including a belt pouch), lithium-ion battery, charger, cleaning pen and power cable are just as much a part of the basic equipment as the first roll of thermal paper. As you are accustomed to with Metapace, you directly put the device into operation upon its delivery. Add to this supplemental optional accessories, among others, a protective case, vehicle mount (including charger), shoulder strap and magnetic stripe reader. As a mobile printer the M-20i of course exhibits special fall protection: it withstands drops from heights up to 2.1 m and is immediately ready for use again. Even when using accessories which you directly attach to the printer, it still impresses in case of drops: when connected with the magnetic card reader it remains unharmed when dropped from up to 1.5 m. Thanks to its well thought-out covering the printer is IP43-protected against the ingress of foreign objects and spray water. With the help of the optional protective cover the protection class is increased to IP54, for example, for working in outdoor logistics areas or at construction sites. The operating temperature range of -15° to +50° C means that the M-20i also provides reliable performance in cold storage or extremely hot transport trailers. Its long battery life also predestines it for demanding areas of application; a single charge keeps it alive up to 24 hours in stand-by mode. Once the battery is empty it only takes 2.5 hours to fully re-charge it. Between work shifts there is no need to wait, since an empty battery is easily and quickly exchanged for a full one.